A 20-year-old man who abused and killed a kitten before putting it in a freezer has been sent to a young offender institution for 16 weeks. Joel White, from Machen, Caerphilly county, strangled the 10-week old pet after it fell off a ceiling lampshade where he had made it perform tricks. 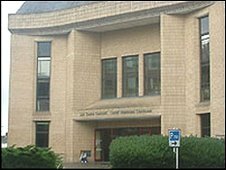 He denied causing unnecessary suffering but was convicted of animal cruelty at Cardiff magistrates' court. He was also disqualified from owning or keeping an animal for 10 years. Deputy district judge Mark Layton told him: "You threw the kitten and then placed it on a lampshade but it fell off. You then strangled it and caused it to die. "The kitten was in a great deal of pain prior to its death." White's girlfriend Joanne Bettridge, 42, who owned the kitten called Pepsi, previously told the court: "He snapped my kitten's neck in front of me - he just wrung Pepsi's neck." She described how Pepsi, one of her three pet kittens, was killed by White who then threw it in the freezer at her home in Cardiff. "He started to threw Pepsi against the curtains," she said. "The claws were digging into the curtains. Then he put the kitten into the lampshade to see if it could do any tricks. "But then it fell down to the floor. There was hardly any movement. "I thought his back was broken, he was crawling across the floor. So Joel then killed Pepsi. "Joel picked him up and I was crying my eyeballs out. "Joel picked him up and wrapped him in a pillow case and took him out of the room and put him into the freezer." Miss Bettridge said that while she was White's girlfriend, their relationship was "mainly platonic". The court heard he "used her for money, food and somewhere to live" when he lost his own rented house. White claimed the kitten was alive when he was asked by police to leave the house after Miss Bettridge's colleagues contacted the Women's Aid support charity. The court had heard that White, who is bisexual, made Miss Bettridge jealous by visiting gay clubs and socialising with gay men. White, who is unemployed, said: "I felt bad for her but did everything I had to do to survive. "I'm selfish. I didn't want to hurt her but I had no-one else. It was convenient for me at the time." He said she falsely accused him of killing the pet because she was "broken-hearted when she saw photos of him with his partner". Ed Mitchard, defending, said: "He used her. He had a lot of emotional problems."